Since I’m trying to replace Microsoft Entourage, I’ve started testing 3 email programs: Powermail 6, Apple Mail, and Postbox 1. For some reason, Apple Mail, Postbox, and Powermail require that you turn off SMTP secure authorization when sending mail through my primary business host (pair.com). Unlike Entourage, which seems to work flawlessly, it has been hit and miss with the other programs until I figured out this unusual setup. I suspect that Pair recognizes me as already signed in, because it requires me to retrieve email before I can send out. However, I’ve discovered a bug in Powermail that does not allow me to do a relay at all. Pair requires I use relay.pair.com instead of smtp.petersonsales.net. While my incoming server is mail.petersonsales.net, my outgoing must be relay at pair. The problem is that Powermail tries to send out using my domain name and I cannot get it to use the proper relay. Importing from Entourage – transferring the email database. I tried native import from Postbox. There is no option to import from Entourage into Postbox, but there is an option to import from Mail. Mail has the option to import from Entourage natively, but 2 attempts to import from Entourage caused a large loss of emails after a certain number were imported, so it was ineffective (my database is about 1.5gigs). Powermail can import from Entourage, but the process is laborious. You must export all mail into an mbox format in order to import it into Powermail. You can do this by dragging every mail folder from your Entourage mailbox to your desktop and then dragging it into Powermail, or you can choose to import the mbox files one by one using the import function, but in either case, you lose your hierarchical, mail folder structure. In order to overcome the problems in Mail import, I found a nice little script by Barry Wainwright that will export all Entourage folders as mbox files. It will also export emails as Eudora folders, which may allow more versatile importing. This saves time when importing to Powermail, but while all the folders are imported, you again lose the hierarchical folder structure. They also are imported by Powermail with an .MBOX extension name. I used a global renamer utility called A Better Finder Renamer prior to import to remove the visible extension. This export script also works for importing into Mail with the same loss of hierarchy. I did find that Mail will import from Entourage mostly correctly if you export from Entourage as a .RGE file and then use Mail to import from mbox files and choose the exported username.rge file. After you have imported the rge into Mail, then you can import into Postbox and Powermail and preserve the hierarchy. 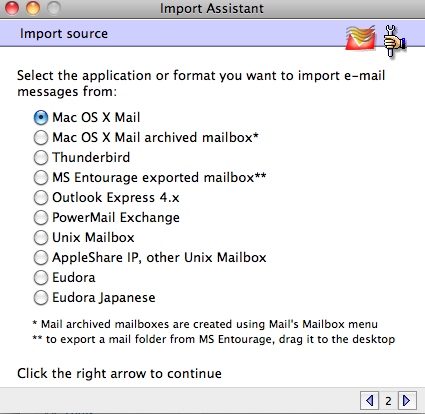 Mail has a reasonable number of options for importing from different mail programs like Thunderbird, Eudora, and Netscape, as well as from mboxes and from itself. But its direct Entourage import leaves something to be desired. Exporting from Entourage is safer. The major problem with the import into Mail from rge is that your folders are duplicated. So, for example, if you have a folder in Entourage named “clients ” with subfolders named “Bob’s Auto,” “Jim’s Windows,” etc., Mail will import the mailboxes, but will also create subfolders for each of the folders with the same name. Bob’s and Jim’s folders are inside folders name Bob’s and Jim’s. Soon the multiplication of folders becomes a headache, with extra layers of hierarchy you don’t need. Powermail has the most options for importing from other mail programs. I ended up importing my mail from Mail and was able to preserve the folder hierarchy. However, it too created the duplication of folders from the Mail import. Because it has imported from Mail, as does Postbox, all the programs are infected by this duplication problem. Powermail puts the folders in a subfolder called Mailboxes, which just makes sorting a little bit harder. However, Powermail’s Recent Mail window makes the problem less disconcerting. Postbox was able finally to import my mailbox folders in hierarchy after the successful import into Mail, but it has the least available options for importing, allowing imports only from Mail, Communicator, and Eudora. But after testing Powerbox and importing to my mail, Postbox crashed with an apparently unrecoverable error, and it would not restart, displaying a message about a missing application data file. Too bad, I was considering it for a replacement because it offers a lot of features and threading of messages. But I cannot afford an unreliable program for my business email. I finally got Postbox to work again by holding down the command key and restarting. So far things are working… but, I’m not sure I trust the program. Filters – the major obstacle! I have many filters for my mail, sorting it for me automatically into client folders, accepted advertisers, personal mail, etc. I probably have about 50 filters. Unfortunately, none of the existing programs allow you to transfer Entourage mail rule (filters) to a new environment. That is because all programs create rules differently. The most ungainly of the three programs is Apple Mail, because to create a mail rule, you must open the preferences and then create the mail rule. That will be inconvenient to say the least for my transfer. Powermail seems to be the easiest program for creating filters, which you can do right from the Settings menu. The process is relatively straight forward. Creating filters in Postbox reveals what seems to me to be the oddity of the way it handles mail. While it is easy to create filters in Postbox, the program keeps your mail on the server unless you actually create a filter and send the mail from the server to a local folder on your computer. This process may mimic Thunderbird and other online readers, but I like having the mail on my computer for a couple of reasons. One, my hosting has mailbox limits and I delete my mail on the server after 30 days using Entourage. Two, if I want to see my files online, I use IMAP settings, and have both for my mail in Entourage. Powermail downloads to local folders automatically as did Entourage. Mail also downloads to the Home folder. So far I have not fully tested Postbox, but I am leaning towards making Powermail my program of choice, if I can get it to work in SMTP. Powermail is actually the closest to the old and beloved Claris Email in OS 9. Mail, though it works well, is not user friendly when it comes to creating filters. Postbox uses an online system that makes setting up filters more complicated but does allow you to use newsgroups. But darn it, Entourage just works and has a good way of viewing and sending newsgroup postings. So far, none of the programs lives up to the ease of use of Entourage. Since Powermail uses Apple’s AddressBook directly, the problem with syncing and duplication of addresses will be gone. Whether AddressBook offers a way of creating mailing labels or merged mail is a question for another day…. But using those features is no picnic in Entourage and Word in any case. None of these replacement options are easy or free of labor. I will have to move and delete plenty of duplicated folders in whichever program I use. And all my signatures, rules, and filters will have to be replaced. For the rare time I use Newsgroups, I have increasing switched to NetNewsWire for those forums which allow RSS. The old format of newsreaders without RSS seems to be dying off. But posting to newsgroups requires a login instead of a simple post from Entourage. I’ll keep you updated as I keep testing.